My girlfriend is awesome and also Canadian. There are few things I’ve learned in the path to understanding Ice Hockey and Maple Syrup. These truths are paramount if you want to date a Canadian. Everyone has an opinion about Alberta. EVERYONE. It’s best to not mention it. It’s like being a Republican in Seattle. Also, Canadians can talk politics and not sound like they dropped out of preschool. I could get used to that. Beers in Victoria cost the same as Seattle. I’m told that’s expensive when talking with Victorians. I’m willing to believe the country lives on booze taxing. On that note, the breweries and distilleries in northwest Canada (or is it southwest Canada?) carry a proud linage. They need to loosen the borders up and let more of it into the rest of the northwest. Now that I’m really getting to see it, it’s like the Northwest has cut off it’s own arm in the microbrew race. Victoria is very beautiful; your significant other may come to your town, look around and think; “How quaint is this?” They will never say it out loud though. They were raised to be better than that. Of course. Good job Canada. There are more pubs per square inch in Victoria than anywhere else on earth. It’s like having a beer festival every day. Don’t like the pub you’re in. Walk ten feet. New pub! MEC is REI – It’s a co-op outdoor recreation store, it’s cool and you become part owner just by shopping there. I’d never heard about it till someone told me on the street. I wonder if they’ve heard of REI? Do you think there are whole movements to make sure people don’t know they both exist? They play music in restaurants and pubs you haven’t heard in years. I heard more music from when I was a kid than ever before. I was told Victoria was retirement community, apparently they meant the music not the people. 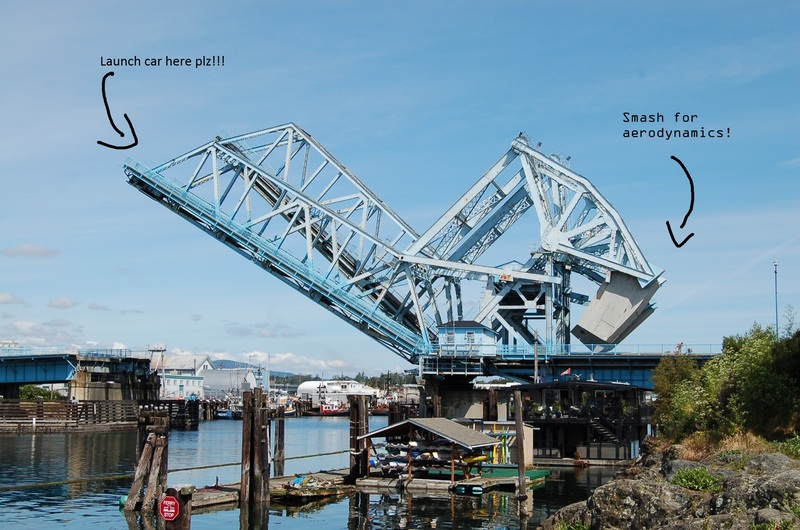 Victoria has a bridge that doubles as a car crusher. Who in the world designed this thing? I have built this chart to help with confusion. Print and keep in your wallet for travel. I’ve labeled this “Part 1” I’m sure there will be at least one more installment in the future. Look for it nowhere good things are sold.